Singer Psy, who has been charged with failing to perform his duties in a special military service exemption program, will be forced to re-enlist in the military. 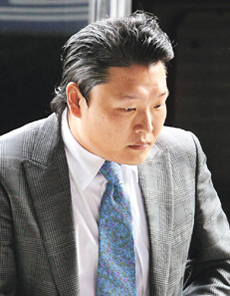 The Military Manpower Administration said on Tuesday that Psy, whose real name is Park Jae-sang, was charged with dodging conscription and that he has been notified that he must serve in the military. Psy will undergo a five-week training program in boot camp and then be placed with a military unit. An MMA official said the 30-year-old singer has until Tuesday to appeal the decision. If there is no appeal, he will receive a written order to begin his service. The MMA determined, through an investigation by prosecutors and an internal inquiry, that Psy owes the military 20 months of service out of the full conscription term of 24 months. A health exam proved Psy to be fit to serve, but because he holds a state certificate on data processing, in 2003 he was allowed to join an alternative service program that allows qualified people to work for companies that serve vital national interests. He was employed as a special agent for a computer programming firm until November 2005. According to Article 41 of the military service law, anyone caught using false statements or materials to join the exemption program or failing to perform the duties of the exemption program will be forced to re-enlist in the military.